All roofing sales training should include the following components, the first one being a methodology throughout the sales process. All successful sales people follow the same tried-and-true method that has predictable results. Closing the sale is not an accident, it is simple if done correctly. One of my old mentors used to tell me his job is easy as a sales person, he just gives the customer what they want. Listen and your customer they will tell you everything you need to know. Most sales people talk too much and I’m sure you’ve heard that before… let’s go through the sales process one step at a time. Qualify your lead, if you don’t have a qualified lead and your meeting with both homeowners there’s no sense in going on the sales call. You have to have all decision-makers available for the appointment, you have to plan on the One Call Close. Prepare a ready-made information package that’s includes all of your products that you’ll be using on the roof, and have a copy of your insurance and a list of references inside the package. Create a PowerPoint presentation that you can use on an iPad so you can go through the process of replacing the roof from start to finish, add photos along with some text and some graphics showing the products being used. Include some before and after photos at the end of the presentation to show your customer some of the roofing work that you’ve completed. Arrive at the property five minutes before your scheduled time, and if you’re going to be late make sure you call the customer before the time has passed for your appointment. You want to make sure your customer knows that they are important, and that their time is as valuable as yours. During your initial meeting with the client you want to do a Meet and Greet to say hello, and begin to build a report with your new client. This is very simple if you just start giving complements of what you like on the outside of the home, and be sincere and make the customer feel good and this will help you dramatically. Ask fact-finding questions to find out if the roof is leaking, ask to see the water stains and take photos with your phone or camera. Talk about any issues in the attic, and most times when the home was built they never vented the bathroom fan outside. This is a good selling point because you can take a piece of plywood off and then connect the bathroom fan hose to an exterior roof vent. Most roofing contractors will not even mention this… Just another way for you a way to differentiate yourself from all the other roofers. Take a ladder off your truck and get up onto the roof and take photos. If you have a drone which I recommend, get out your drone and take photos and have them ready to upload onto your iPad so you can show your customer the problems and you can give them a solution. Obviously your roof replacement services… But don’t start selling yet, just start mentioning what you can do, to fix this problem. Then go through your PowerPoint presentation and show the customer how your company can remove the old roof and install a brand new roof it is going to take care of all the problems they were having. Then ask them if this is what they want, just to make sure they understand and you get confirmation that this is exactly what they want. Very important step in if you don’t ask this you may not get the order. Go over all your numbers with your client and start with a price that is your retail price. I usually put this on a handwritten sheet that’s printed out of the contract, I like to use the Appointment Sheet because I write things down as were going through the estimate because I asked questions, and then I write them down right in front of them. 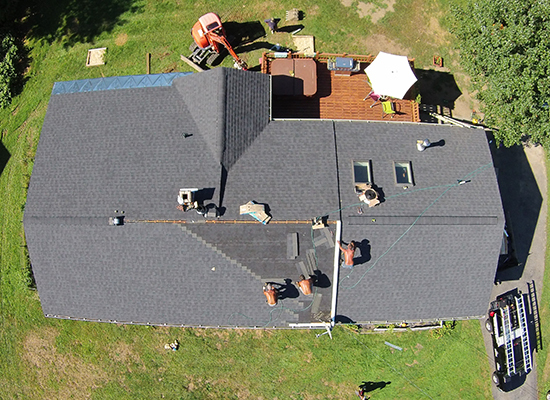 I also draw a diagram of the home or upload the drone photo and use our roof sketch. And give them a number of how much the roof is going to cost, And then ask them would you like to go ahead and schedule the roof installation. you may get some resistance initially and they may say no we want to get all their estimates, take a minute and then say “I understand if I was in the same position I would feel the same way” But we have included all the things that you want done to your roof, and with our professional installation crew so you know this is going to be installed correctly. What if I can work the numbers a little bit with that help you with making your decision today? Yes Great Write Up The Order or No OK… Where did you think this project was going to come in at … wait for an answer and then say well I can’t do that but I can give you $500 off today or whatever you can for price and then call it a discounted price… People love a discount and it will help you close more sales trust me on this one. Create the estimate using the software, send it over to your customer email and have them sign with the COS-eSign digital signature system and everybody will get notified via email, and the signed document will be uploaded to your software automatically. Your customer will be so impressed with your presentation, and at that point let them relax a little bit and then just talk about the scheduling and when you’re going to get started, and help your customer understand that they have just made a great decision. At first you may think 12 steps to selling a roof is a lot, it really is all about going through the same method over and over again because it’s really always the same thing different house. If you’re not one of our Contractor OS subscribers make sure you get signed up so you can use all the tools we have inside to your advantage and help you make more sales. Start your a seven day trial offer below for only one dollar and see how this incredible system will help your business.